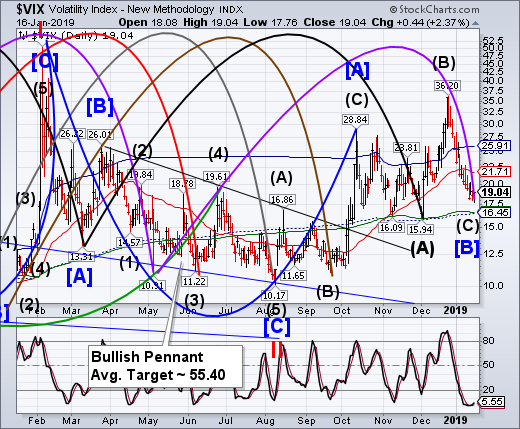 VIX extended its Master Cycle low to futures and options expiration. This makes sense since there is a huge Dealer/Institutional presence in the short-vol trade in futures, options, and other volatility sensitive products. -- The NYSE Hi-Lo Index has been creeping beneath the 10-month trendline instead of a breakout. This means that less than 1% of the more than 3200 issues in the NYSE are hitting new 52-week highs in this rally. In fact, not a single S&P 500 issue has hit a new 52-week high in the past three weeks. (DailyReckoning) Fed Chair Jay Powell did not deliver any early Christmas presents to the markets last month, but he did pop the cork on a bottle of Champagne as a belated New Year’s gift on Friday, Jan. 4. 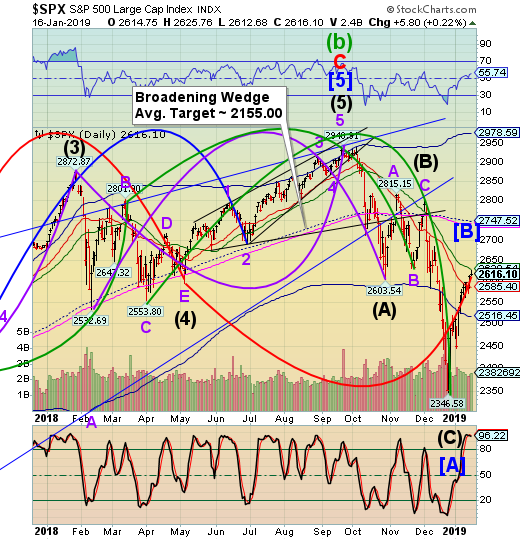 -- The SPX extended its rally to the 50-day Moving Average at 2628.54 and closed beneath it. In the process of doing so, it made a Master Cycle inversion. The decline is due to resume in a matter of days, according to the Cycles Model. (Bloomberg) The global rebound in equities from December’s gut-wrenching sell-off has many calling it a “melt-up,” defined as a sharp and unexpected gain driven by a stampede of investors who don’t want to miss out rather than any fundamental improvements. Including Wednesday’s gains, the MSCI All-Country World Index has rallied 9.13 percent since Christmas. That’s better than the gauge’s 7.28 percent surge in the first four weeks of 2018, a performance many compared to a bubble that was ready to pop — which it did, tumbling 9 percent over the following two weeks. Although the latest moves come with most economists downgrading their outlook for global economic growth and corporate earnings, it’s not as if the move has been built on smoke and mirrors. Medley Global Macro-Managing Director Ben Emons has zeroed in on three plausible reasons for sentiment quickly shifting for the better. First is the rally in China’s yuan, which has reduced the risk of a capital flight from the country that would throw global markets into turmoil. The yuan has appreciated on speculation authorities will continue ramping up their stimulus efforts to keep the local economy from slowing much further — as it did this week. 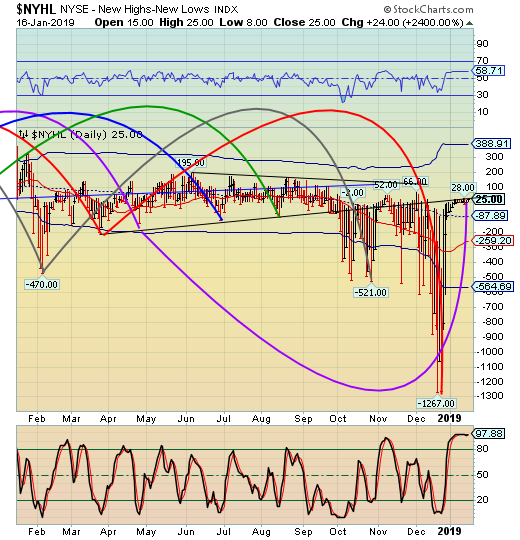 -- NDX also had a Cycle inversion (high). The rally managed to close over the 50-day Moving Average at 6640.42. There is a new Head & Shoulders formation with the right shoulder being completed. 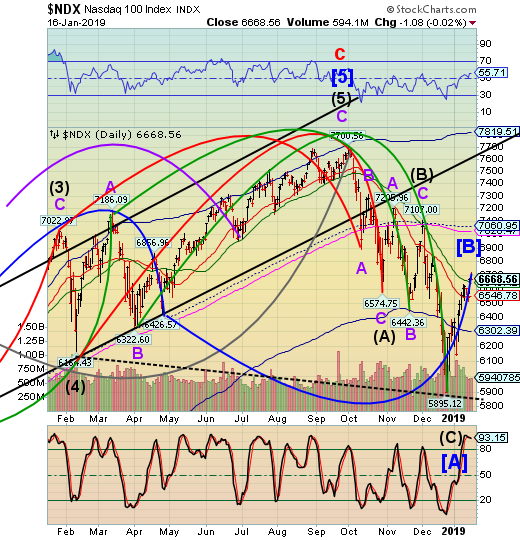 There is a potential of a probe to 6750.00 to complete the rally. (ZeroHedge) While many traders saw the mid-December market meltdown as a "catharsis" of sorts, a long overdue and much-needed "mean reversion" process, one which hit hard stocks that were the biggest winners of 2018 and slammed "momentum" names, those which had enjoyed the biggest pile-up of "smart money", while names that had seen little institutional interest (and were heavily shorted) outperformed, arguably bringing some semblance of normalcy to a gaping valuation dispersion, one month later something unexpected has emerged. According to Sanford Bernstein, momentum stocks have not only regained their mojo in the past three weeks but according to Bloomberg, now display a valuation gap relative to losers that widened to levels not seen since the dot-com era. "This is worrying - the spreads are (much) higher than they were in February 2009 – a catastrophic career-costing period for momentum," Bernstein wrote in the note to clients. "This shocked us and caused us to double check our numbers."